Looking for NWDA LDC Syllabus 2019? then, check out this page. Now, after applying for the NWDA Recruitment 2019 you must collect the nwda.gov.in LDC Exam Syllabus 2019 through the current article. Furthermore, the officials of the National Water Development Agency (NWDA) are planning to conduct the Lower Division Clerk, Junior Engineer, Stenographer, Junior Accountant Examination 2019 in the month of March 2019. Check the latest राष्ट्रीय जल विचलन ऑटोनकस Exam Pattern and also the NWDA LDC Selection Process 2019 from the below sections of this page. Also, the direct link to download the NWDA LDC Exam Syllabus 2019 is also attached to the bottom. Candidates need to note that the NWDA LDC Selection Process 2019 is different for the vacant Lower Division Clerk, Junior Engineer, Stenographer, Junior Accountant posts. So, look at this section to know the procedure or rounds that are prescribed by the officials of the National Water Development Agency (NWDA). Check the below table to get the latest NWDA LDC Exam Pattern 2019. Furthermore, you can get the details like the name of the subject, the number of questions, the allocated marks for each subject. So, do follow the listed topics to cover those before the examination. And the total time allocated for the exam is 2 hours. Moreover, there is no negative marking for the test. Candidates need to start preparing for the examination by downloading the NWDA LDC Syllabus 2019 PDF from the direct link given below. So, prepare and practice well all the questions given in the below list. Furthermore, you can also find the exact tips to prepare effectively for the test. 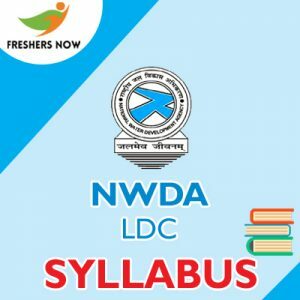 Collect new NWDA LDC Syllabus 2019 and NWDA LDC Exam Pattern 2019. Estimate the important concepts whose weightage is more. Concentrate more on the high weightage subjects while preparation. Practise NWDA LDC, Steno, JE, JA Previous Year Question Papers. Also, attend any mock exam before the test date to know how much fit you are for the test. After completing the test preparation, revise all the concepts carefully. Follow us on FreshersNow.Com for more information of the NWDA LDC Syllabus 2019.